1 What is H.264 ? H.264 is an industry standard for video compression, the process of converting digital video into a format that takes up less capacity when it is stored or transmitted. Video compression (or video coding) is an essential technology for applications such as digital television, DVD-Video, mobile TV, videoconferencing and internet video streaming. Standardising video compression makes it possible for products from diﬀerent manufacturers (e.g. encoders, decoders and storage media) to inter-operate. An encoder converts video into a compressed format and a decoder converts compressed video back into an uncompressed format. Recommendation H.264: Advanced Video Coding is a document published by the international standards bodies ITU-T (International Telecommunication Union) and ISO/IEC (International Organisation for Standardisation / International Electrotechnical Commission). It defines a format (syntax) for compressed video and a method for decoding this syntax to produce a displayable video sequence. The standard document does not actually specify how to encode (compress) digital video – this is left to the manufacturer of a video encoder – but in practice the encoder is likely to mirror the steps of the decoding process. 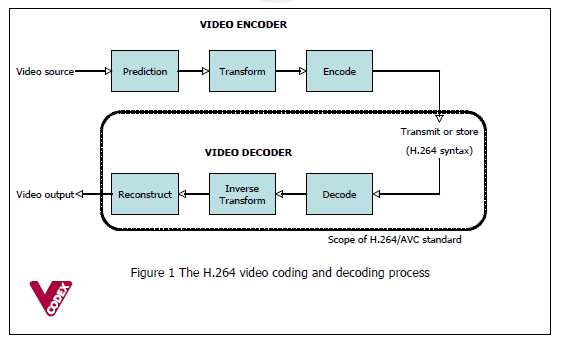 Figure 1 shows the encoding and decoding processes and highlights the parts that are covered by the H.264 standard. The H.264/AVC standard was first published in 2003. It builds on the concepts of earlier standards such as MPEG-2 and MPEG-4 Visual and oﬀers the potential for better compression eﬃciency (i.e. better-quality compressed video) and greater flexibility in compressing, transmitting and storing video. 2 How does an H.264 codec work ? An H.264 video encoder carries out prediction, transform and encoding processes (see Figure 1) to produce a compressed H.264 bitstream. An H.264 video decoder carries out the complementary processes of decoding, inverse transform and reconstruction to produce a decoded video sequence. A block of residual samples is transformed using a 4x4 or 8x8 integer transform, an approximate form of the Discrete Cosine Transform (DCT). The transform outputs a set of coeﬃcients, each of which is a weighting value for a standard basis pattern. When combined, the weighted basis patterns re-create the block of residual samples. 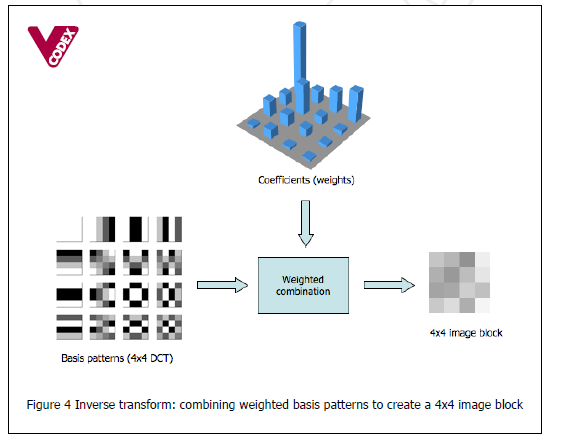 Figure 4 shows how the inverse DCT creates an image block by weighting each basis pattern according to a coeﬃcient value and ombining the weighted basis patterns. The output of the transform, a block of transform coeﬃcients, is quantized, i.e. each coeﬃcient is divided by an integer value. Quantization reduces the precision of the transform coeﬃcients according to a quantization parameter (QP). Typically, the result is a block in which most or all of the coeﬃcients are zero, with a few non-zero coeﬃcients. Setting QP to a high value means that more coeﬃcients are set to zero, resulting in high compression at the expense of poor decoded image quality. Setting QP to a low value means that more non-zero coeﬃcients remain after quantization, resulting in better decoded image quality but lower compression. information about the complete video sequence. These values and parameters (syntax elements) are converted into binary codes using variable length coding and/or arithmetic coding. Each of these encoding methods produces an eﬃcient, compact binary representation of the information. The encoded bitstream can then be stored and/or transmitted. A video decoder receives the compressed H.264 bitstream, decodes each of the syntax elements and extracts the information described above (quantized transform coeﬃcients, prediction information, etc). This information is then used to reverse the coding process and recreate a sequence of video images. The quantized transform coeﬃcients are re-scaled. Each coeﬃcient is multiplied b an integer value to restore its original scale2. An inverse transform combines the standard basis patterns, eighted by the re- scaled coeﬃcients, to re-create each block of residual data. These blocks are combined together to form a residual macroblock. 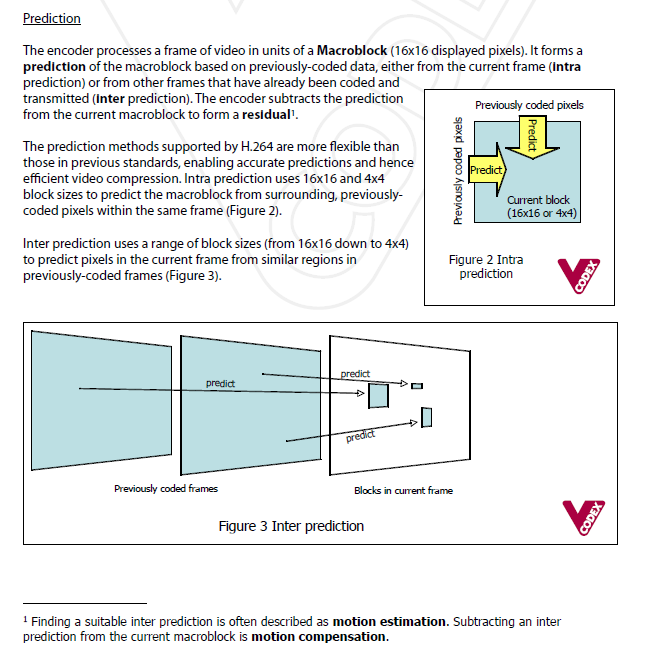 For each macroblock, the decoder forms an identical prediction to the one created by the encoder. The decoder adds the prediction to the decoded residual to reconstruct a decoded macroblock which can then be displayed as part of a video frame. A lower compressed bitrate for the same image quality. For example, a single-layer DVD can store a movie of around 2 hours’ length in MPEG-2 format. Using H. 264, it should be possible to store 4 hours or more of movie-quality video on the same disk (i.e. lower bitrate for the same quality). Alternatively, the H.264 compression format can deliver better quality at the same bitrate compared with MPEG-2 and MPEG-4 Visual (Figure 5). The improved compression performance of H.264 comes at the price of greater computational cost. H. 264 is more sophisticated than earlier compression methods and this means that it can take significantly more processing power to compress and decompress H.264 video. As well as its improved compression performance, H.264 oﬀers greater flexibility in terms of compression options and transmission support. An H.264 encoder can select from a wide variety of compression tools, making it suitable for applications ranging from low-bitrate, low-delay mobile transmission through high definition consumer TV to professional television production. The standard provides integrated support for transmission or storage, including a packetised compressed format and features that help to minimise the eﬀect of transmission errors.